Enemies become allies as the sands shift in a novel that’s big on situational relativism. 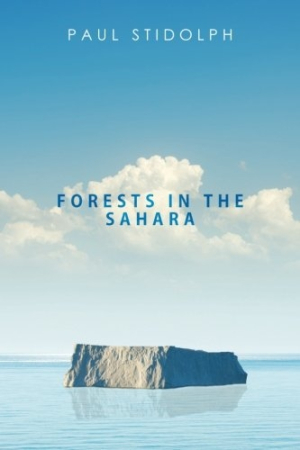 Paul Stidolph’s Forests in the Sahara moves from an original premise into a compelling tale of intrigue and danger. London-based professor Jeffrey Harvey has an ambitious if eccentric aim: to use an oil tanker to haul iceberg water from Antarctica to drought-ravaged Africa, where it can be used as drinking water. His bold if moonshot attempt to solve a humanitarian crisis becomes further complicated by the added challenges of his mysterious, troubled past, which invites unforeseen dangers, such as a high-stakes run-in with heroin smugglers. Jeffrey’s girlfriend, Anna, opens the book proposing a toast: “To those forests in the Sahara that you are going to plant.” Jeffrey soon has a sobering confrontation with the corrupt park ranger Tyro Mukasa, who believes that Jeffrey killed his brother Arthur to steal his scientific research. Tyro is hell-bent on revenge. Characters are well established, thoroughly developed as the novel unfolds. They’re given plausible and detailed motives, including vengeance, greed, love, ambition, and careerism. Jeffrey stands out as a complicated, multifaceted figure who’s haunted by his past, but even supporting players are rendered vividly. Characters who are introduced as one dimensional are revealed by layers as the plot progresses. Enemies become allies as the sands shift in a novel that’s big on situational relativism. A few odd descriptions and developments muddy the otherwise strong text, but with its blend of scientific audacity, dark secrets, and high stakes, the book remains widely appealing. Forests in the Sahara is a captivating thriller with many twists and turns that is grounded by its emotional depth and resonance.